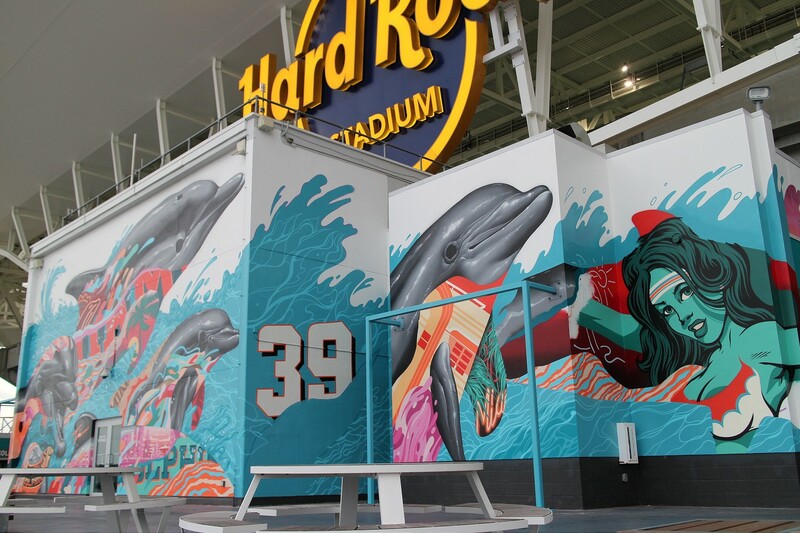 After Goldman Global Arts turned Wynwood into one of the world’s street art capitals with Wynwood Walls and other programs, CEO Jessica Goldman Srebnick joined forces with Miami Dolphins team owner Stephen Ross, organizing and curating a mural project as a part of the recent stadium rebranding program. 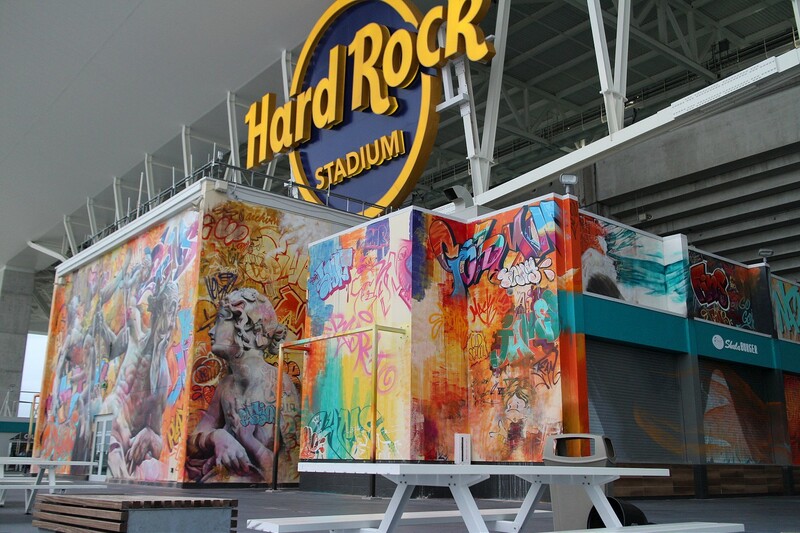 Over the course of several months, a select group of international artists were invited to secretly paint Hard Rock Stadium, helping to create one of the most unique collections of such work worldwide. 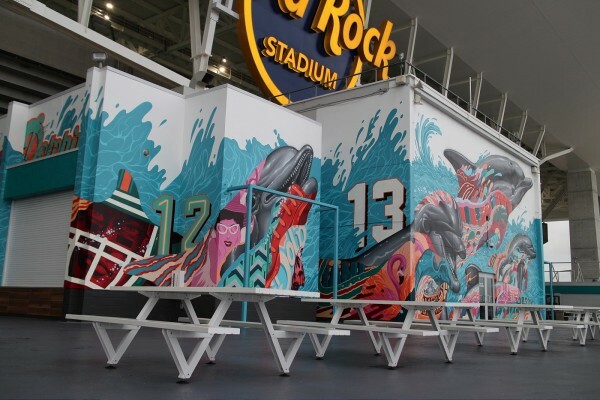 Using the immense structure as their canvas or even blackbook, the artists painted everything from its outside walls, to the hallways and gates, creating some 30,000 square feet of art. 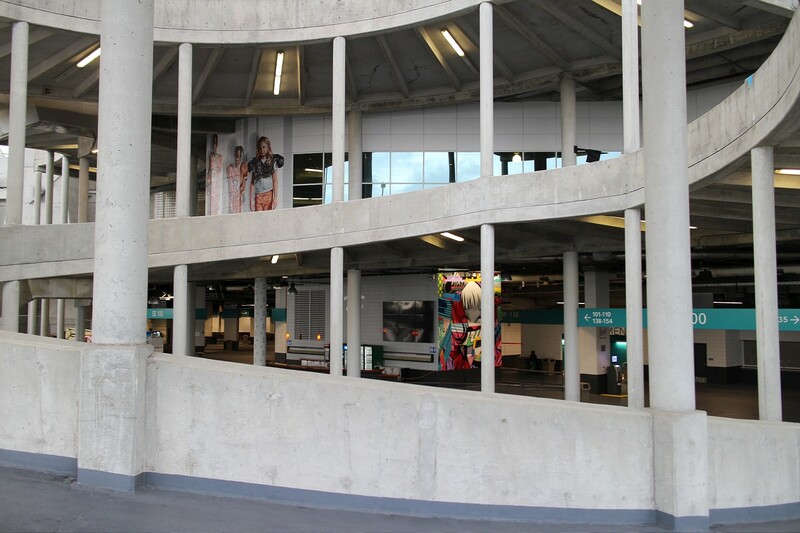 With a facility capacity of 65,000 visitors, not only the scale of the works is exceptional, but the level of exposure to the general public is quite high. 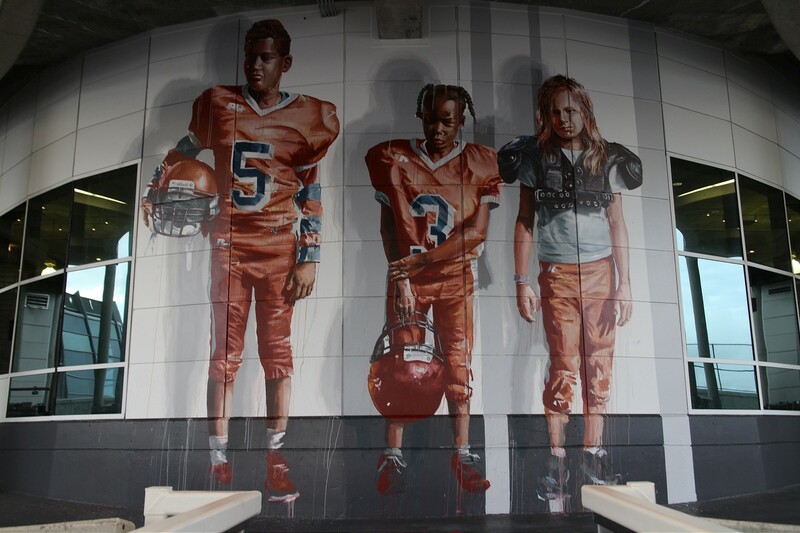 Collaborating with some of the artists that were part of the Wynwood Walls project in the past, as well as new ones, the stadium now hosts pieces by artists that are well known to our readers by now. 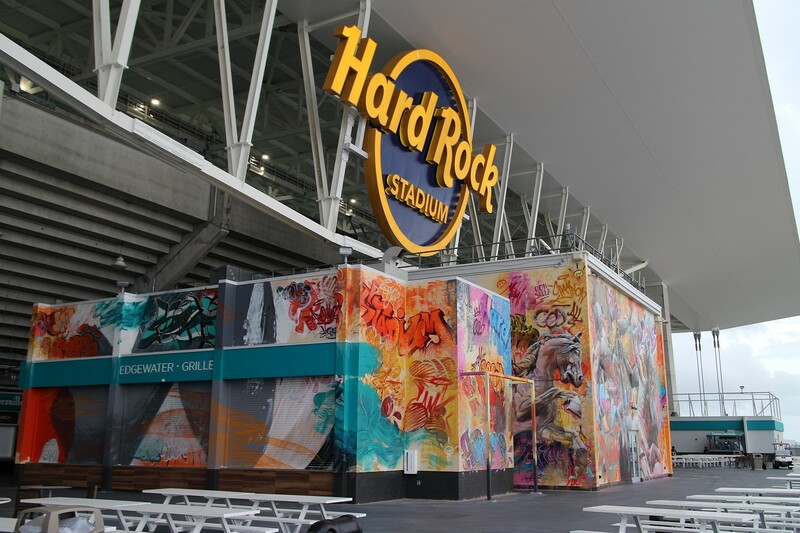 From the abstract forms in an outer area by Momo, psychedelic renderings by How & Nosm, expressive figurative pieces by Fintan Magee, vibrant creations by Jen Stark and Felipe Pantone, all the way to large scale graffiti based assemblages by PichiAvo and Tristan Eaton (seen above) visible from the nearby turnpike, the project successfully transfers the energy and excitement from the field throughout the premises. 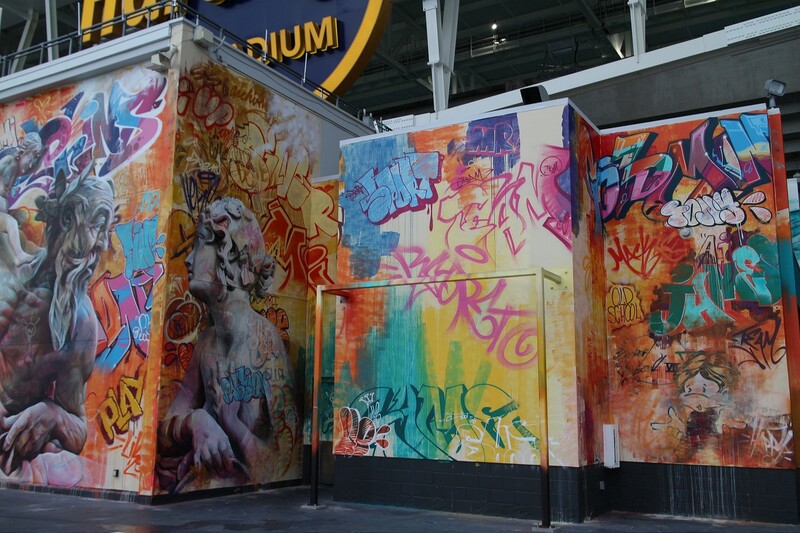 With many of the artists using the club’s iconography in their work, the program is definitely pushing the idea of muralism to new heights. 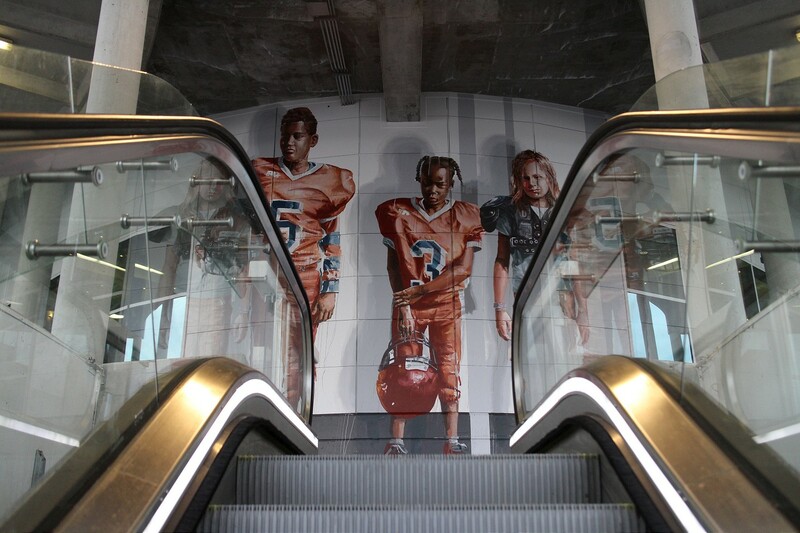 The dedication of the team can be witnessed through such examples as hiring the same mason that worked at the stadium back in the 70s, to create a wall for Portuguese artist Vhils to carve in a portrait of the legendary coach from that era – Donald Francis Shula. The full list of featured artists also includes Logan Hicks, Assume Vivid Astro Focus, Dasic Fernández, 1010, CRASH, London Police, POSE, and Case, and interestingly enough, the club has had a nice series of wins ever since the new, rebranded stadium opened its doors. Categories: Street & Urban Art. 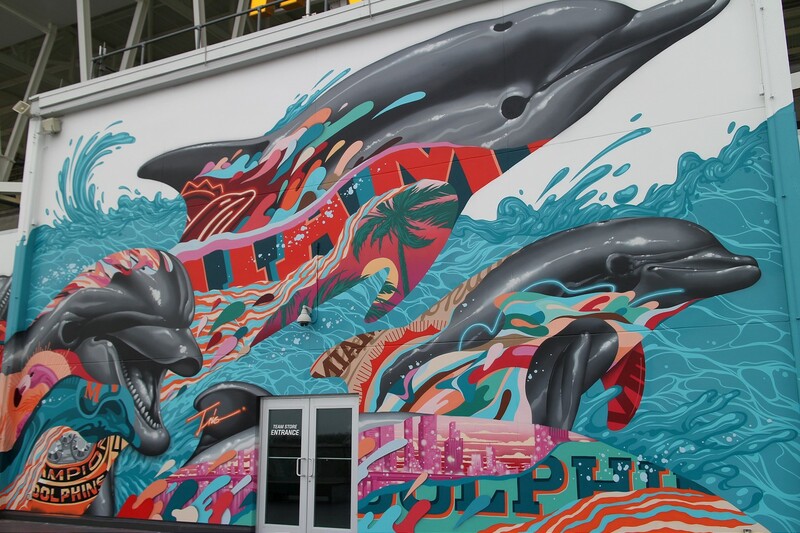 Tags: 1010, Assume Vivid Astro Focus, Case, Crash, Dasic Fernandez, featured, Fintan Magee, HOW & NOSM, Logan Hicks, London Police, Miami, MOMO, PichiAvo, POSE, slider-featured, Street & Urban Art, Tristan Eaton, Vhils.